Happy one year wedding anniversary to Cassie and Brint! Oh this epic barn wedding did my heart soooo good you guys!! Cassie and Brint were WONDERFUL to work with - hands down one of my favorite couples. Two of the nicest, most selfless individuals, ugh, adore them! Their wedding was held at the b-e-a-utiful Timber Barn up at Weston Red Barn Farm, and it was my first time shooting at this new barn of theirs! Basically, it's a dream. Ideal and perfect location. And that's pretty much all you need to know. I loved the moment when Brint first saw Cassie, he was so happy! I loved loved loved their portrait time in that field of GOLD that was right next door to the barn!! Just look at them! Their peaceful ceremony was so ideal. When I say peaceful, I mean it. There were grazing cows out in the nearby distance, just flapping their tails. The sun started to set, and the moon started to rise, the winds were calm. Perfection. Their head table set up??? JUST WAIT TIL YA SEE IT. I have yet to photograph a head table I love as much as I love C+B's. It's ideal. It's everything. I want it in my house, the whole thing. (Sidebar: I actually OWN some of those tree stumps now, because Cassie and Brint are just that awesome you guys!!!) Everything about their head table is my style, and such a big part of ELP branding!! Happy First Anniversary to this amazing couple!! Adore y'all! 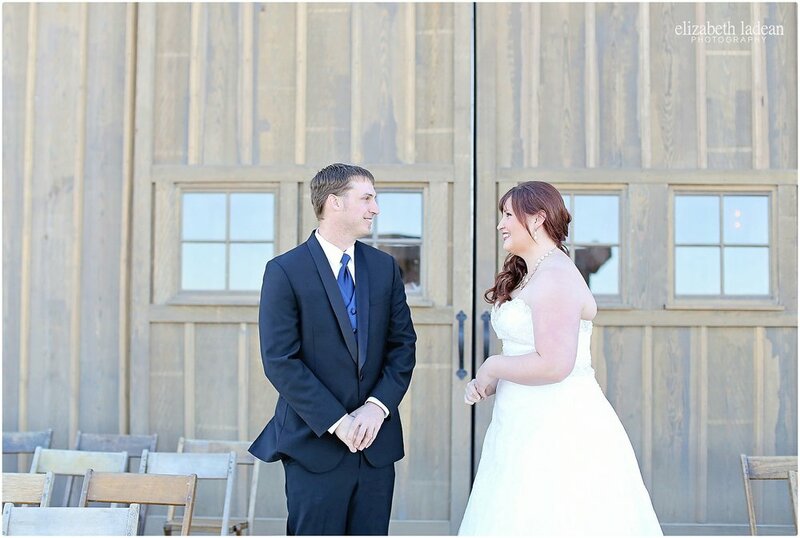 See Cassie + Brint's Wedding Day story and more photos!